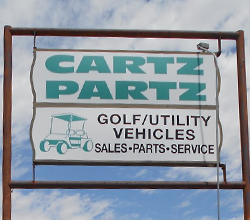 Cartz Partz is proud to have been in the golf cart sales and service business since 1992; over time we’ve built many long-term relationships with clients who trust our team, and importantly, our integrity. We don’t oversell your service needs, and will ONLY recommend work that needs doing. When it comes to golf cart sales, new or used, our goal is to match you with the perfect cart for your needs and your budget. Need to know how certain carts compare to others? Not familiar with the requirements for having a street legal cart? Whatever your question, we’re here to help – just get in touch! Give us a call at 602-788-0355 to discuss your needs. Owned and operated by Sal and Ann Marie Grande, our experienced staff is trained to service, repair and maintain just about any golf cart…gas or electric. We are proud of our service record and are committed to offering the best value in town, delivering quality and value to customers from Sun City to Sun Lakes, and all parts of Phoenix in between. We can also help you personalize your cart by adding custom rims and/or many other accessories that will make your cart one in a million! As well as being a member of the BBB, we are a licensed auto dealer and a member of the Arizona Independent Dealer Association. Rest assured that we carry the necessary insurance and licenses needed to be certified by many corporations and management companies. Whether you are looking for a golf cart for work, recreation or personal use, we have, or can create, a cart designed to meet your needs. Call 602-788-0355 or email us for additional information about our services and options; we’d be delighted to hear from you.